EcoSphere – “Sea Monkey” for the Adult! I always wanted a "Sea Monkey" but never have the chance to own one. Mum wasn’t too keen to let me grow these "alien non-appealing" creatures in some creepy acrylic tanks with fish-eye lens. She thought they looked like bacteria. I also love to own an aquarium. Watching colourful fishes swimming gracefully in a big tropical tank can be so relaxing and mind-levitating. But taking care of one can be a hassle and too time-consuming. My dad gave up on me and flushed my pet guppies down the toilet bowl. I discovered the "EcoSphere" when I visited the science centre 20 years ago. It was a perfect glass sphere with no openings – just seawater, sand, branches and shrimps. It was meant to be a perfect life-sustaining vessel. 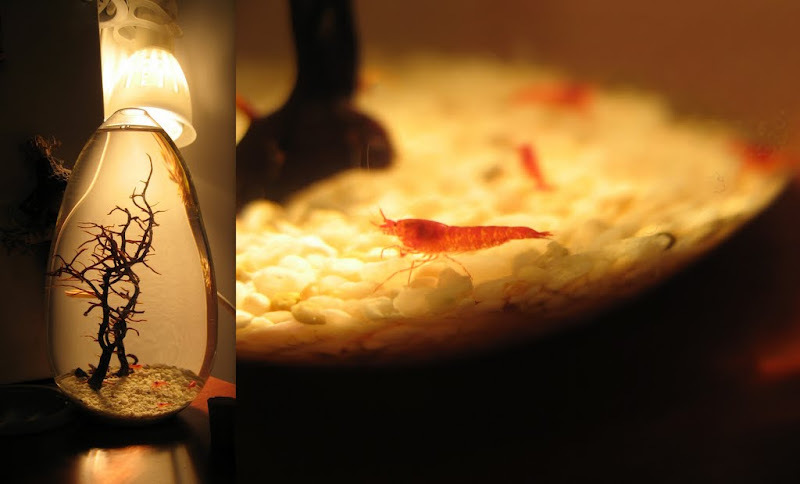 The shrimps will give off carbon dioxide (& fertilizer) to sustain the algae which in return provide food and oxygen for the shrimps. All you need is water and light – which maintain enough growth and keeping the water temperature constant thru out the year. It was a super expensive "toy" back then. You see, it wasn’t the man-made eco-system which amazed me, I was pretty impressed that there are such aquariums designed and produced for lazy people like me. During my trip to Taipei last Dec, I found these "EcoSphere" in SOGO – only this time, it is very affordable. I bought an egg-shaped glassware which contains some sea-branches and 5 tiny Hawaiian shrimps. (Yes, I have to hand-carry this to HK and then to Shanghai). For the past 6 weeks, I just left them alone. There is no need to feed them or change water – the seawater is still 100% crystal clear! Like a snow-globe, it is fun just watching these tiny creatures swimming around the glass. Yes, they aren’t as pretty as "Nemo" but they are sure better than those gimmicky sea monkeys. And they can last up to 8 years in that perfect condition. 3 Responses to EcoSphere – “Sea Monkey” for the Adult! You don’t have to go taiwan to get it nor dirty your hands to make one anymore. Ecospheres are now available in Singapore…..
Harloo.. wah yes, I certainly agreed with ya "EcoSphere" thingy, I like it. Simple to maintain & its nice. Its alway been my hobby to keep an aquarium, just looking at it takes away your stresses… Do teach me how to go about setting up this.. am keen to.